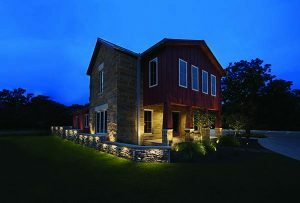 WAC Landscape Lighting introduced new hardscape LED luminaires for a variety of exterior lighting applications. The luminaires feature dual 2700K and 3000K CCTs (correlated color temperature) and integral brightness control. With a constant output of 9-15 volts, the fixtures deliver up to 330 lumens with a 90-plus CRI (color rendering index) and a life of over 50,000 hours. IP66 rated and protected against high-pressure water jets, the fixtures are also factory sealed and watertight. The luminaires are made of corrosion-resistant aluminum alloy and tightly spaced with diffused LEDs for even illumination. The fixtures are available in bronze on aluminum, graphite and sand finishes in four sizes: 3, 6, 12 and 18 inches. The 6-, 12- and 18-inch options also feature CCT selection and integral brightness control. Mounting accessories are included.